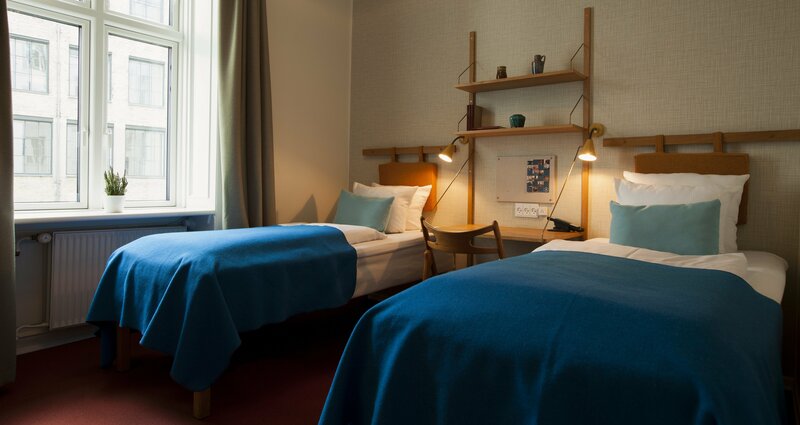 The twin rooms have two separated beds. The rooms are either facing the side street (Studiestræde) or the courtyard. The rooms are either dedicated to the 50s or to the 60s. All rooms have private bath/toilet, desk/chair, sound-reducing windows, electronic safe, telephone with direct dial option (local calls only), flat screen TV, electric kettle with the possibility to make coffee/tea. All rooms come with private safes and bedside tables. Sit, work and relax, all in classic danish retro style. Click here too check our services and facilities. Private bathrooms, free towels, Orla Kiely soap and unique fixtures.